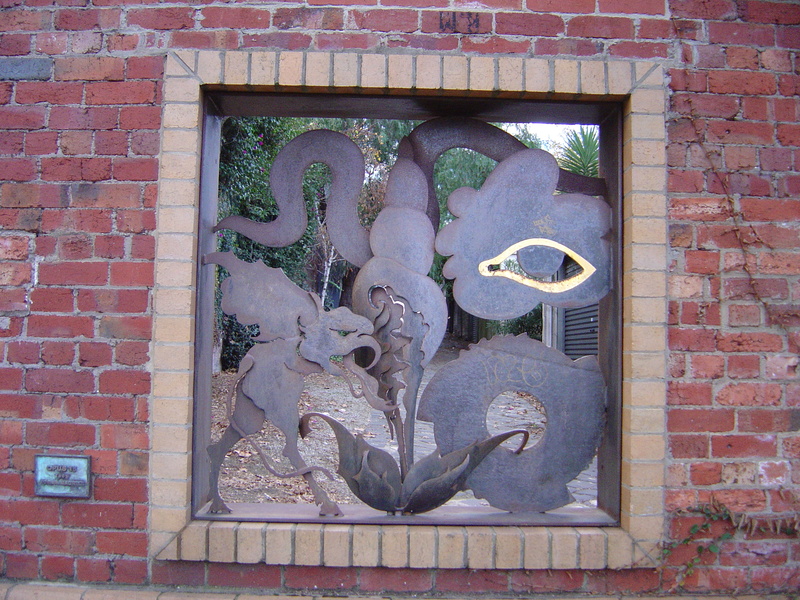 On the corner Punt Road and Bridge Road in Richmond there is a small park area officially called “Urban Art Area”. Nobody was using it when I was there. I’m not sure who would use it in the area – it might be all right to sit on the bench and eat lunch if you worked in the area but I doubt it. “Everywhere, there and here” comments on this park “(the angry looking sculptures aside) yet I have only seen one person ever actually sitting in the site.” Beside the busy Punt Road the little park is multi-level area and contains three sculptures. It is the site of the former Richmond Cable Tramway Engine House that was demolished in 1991; Melbourne had several independently operating cable tramway companies prior to the current electric tramway system in the early 20th Century. The site is heritage listed for what that is worth. Of the 3 sculptures: one sculptor appears to have disappeared, another works in a completely different direction and one has gone on to produce more significant works of public sculpture in a very different style. These are the results of this shotgun approach to public art collecting. There was no information on site of name of one the sculptures – a dog, a bridge and a boat with the words “Yarra” and “Acheron” on its bow and prow. 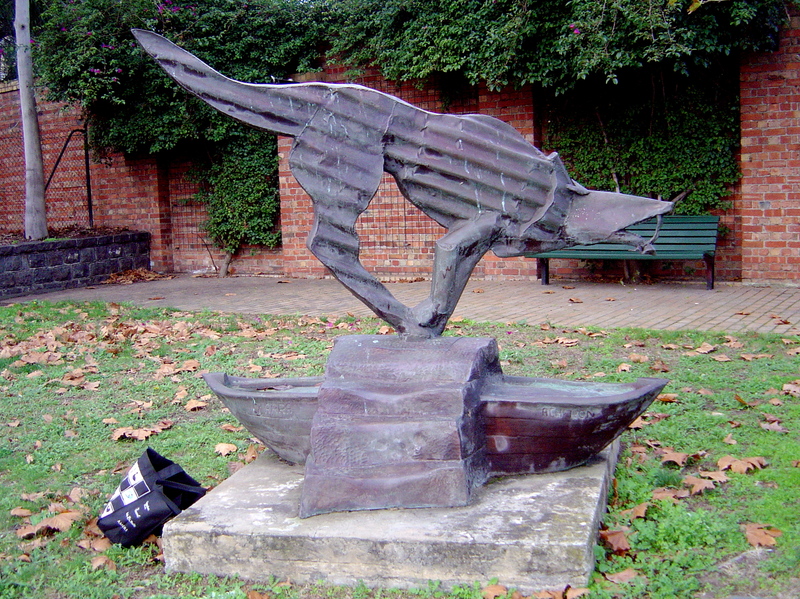 It is Anton Hasell’s “Running Red Tiger”, 1995, bronze; what appears to be a dog is meant to be an extinct thylacine or Tasmanian tiger, a carnivorous marsupial and the tiger also references the Richmond football team. Anton Hasell (Dr Anton Hasell of the Australian Bell Pty Ltd) has gone on to produce many commemorative bells notably the Australian Bell for the Australian Centenary in 2001 and HMS Beagle Ship Bell Chime commissioned by Darwin City Council. Stlg48 wrote a blog post about Anton Hasell’s exhibition at the Bendigo Art Gallery in 2010. Mary Perrott Stimson’s large figurative bronze sculpture, “Mother and Daughter” 1993-94, stands out against one wall. Although intended as a friendly statement the sculpture does not help the corner. Mary Perrott Stimson has created another public statue, “Reading the News”, 2001, located in Wagga Wagga but I have not been able to find out anything else about this artist. The most successful sculpture on the corner is Adrian Mauriks’ “Opus 15”, 1995, of cut steel. This surreal sculpture contains a view onto the back lane and is the only sculpture to refer to the local environment. Adrian Mauriks now mainly works on in white painted epoxy resin and stainless steel and there are examples of his work at Chadstone Shopping Centre, Docklands New Quay Precinct, Bundoora Park, and Deakin University’s Burwood Campus. There is also an earlier work of his in marble in the lawn section of Sprinvale Cemetery. Amongst his early works is a “Homage to Jean Arp” 1972, plaster, showing the Dada/Surreal influence in his work. This little corner in Richmond demonstrates that landscaping and erecting sculptures is not sufficient to revitalize an urban space. This entry was posted on Sunday, July 17th, 2011 at 1:50 PM	and tagged with Adrian Mauriks, Anton Hasell, cable tramway, park, Richmond, urban renewal and posted in Public Sculpture. You can follow any responses to this entry through the RSS 2.0 feed. I disagree with some of your comments about the “urban art space’ at the corner of Punt and Bridge Roads in Richmond. The value of such spaces is not always measured by the number of people who sit there. Instead they are benefit to all who pass by. 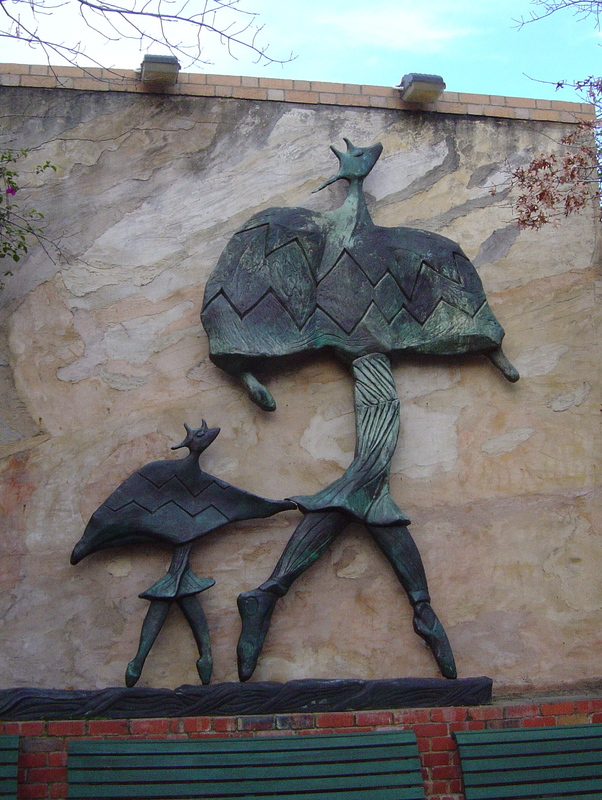 On my daily journey to and from the city, I love looking at the sculpture of “mother and daughter”. Quite frankly, it makes my day! As I am jostled about in an over-crowded tram, I feel somehow centred by the deceptive simplicity of this sculpture, which captures the tenderness a quintessential relationship. Thanks Antoinette, good to hear that the ‘urban art space’ does work for someone and how it works for them. I don’t think that it was a lack of theme but a lack of a reason to use it, to want to be there. That art is not enough for people to sit by a major road. I hope that my name for the park has caught on but I haven’t heard of anyone using any name because so few people use it.